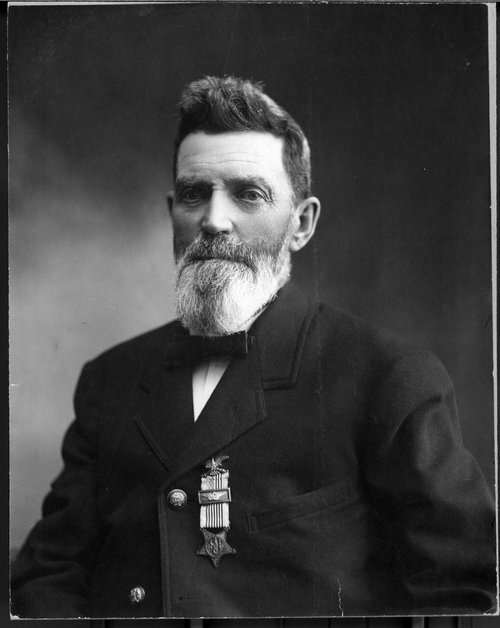 This photograph shows a formal portrait of Charles Wolcott Smith, (1831-1907). Smith a native of Portage County, Ohio, migrated to Lawrence, Kansas in 1854 from Lowell, Massachusetts as a member of the New England Emigrant Aid Company. A carpenter by trade, Smith was fortunate to escape from danger during Quantrill's Raid on August 21, 1863, as he was working on a building west of town. When he received word of the raid, Smith immediately came to the rescue to build wooden boxes for the deceased. On July 30, 1907, Smith died at the age of seventy-five at the home of his daughter Allie Omstead in Lawrence, Kansas.